HMG Paints Ltd, the UK’s largest Independent paint manufacturer, has announced the launch of a revolutionary, one visit application, commercial vehicle topcoat. Acrythane 4G is a high gloss, high solids acrylic polyurethane coating developed to meet and exceed the stringent requirements of the commercial vehicle market. Ideal for OEM, repairers and builders within a demanding marketplace, Acrythane 4G has an optimised balance of early hardness, fast cure and long pot life. Its ultra-fast air-dry properties create process and energy savings for users. Developed to provide outstanding gloss, final appearance and durability over a range of HMG primers, Acrythane 4G offers enhanced properties over traditional systems. 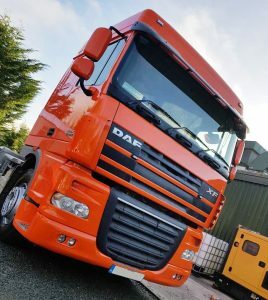 “I have been using HMG products for many years now, the 4G product is without doubt the best gloss I’ve seen from a Commercial Transport coating” said Kenny Wells of Wells Coachworks. With its revolutionary “one visit application,” Acrythane 4G does not require the end-user to observe the usual intermediate flash-off time. This allows the end-user to save not only time but also energy and materials. Feedback from early users included comments such as “4G is a fantastic product! From its application to its flow out, resulting in an outstanding gloss finish. We just love it.” Brendan Whelan, Enniscorthy Autobody Ltd.
Acrythane 4G is both VOC and REACH compliant and available as both a coloured topcoat and Clearcoat. Utilising HMG’s innovative UNIT LITE tinting system Acrythane 4G is available in a wide variety of colours including RAL, BS and Commercial Vehicle standards. 4G can be applied by conventional gravity and HVLP spray guns, giving coverage of 9.3 square metres per litre @ 50 microns film thickness. Surface preparation is as simple as a solvent wipe or shot blasting. For more information please visit https://www.hmgpaint.com/products/landing/Acrythane4G contact HMG direct on 0161 205 7631 or visit your local HMG Distributor.